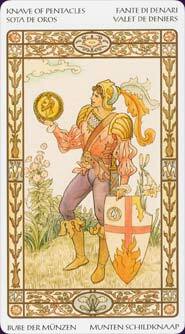 As a Message: Messages about money, a good, unexpected turn in health, a lucky happenstance or work. As Time and Environment: This Page's element of Earth works in favor of this time. There is new growth, steady development. Everything from the economy to the body seem youthful and healthy. As a Child or "Child-like" Person: The Page of Pentacles is a hands-on sort of child or child-like adult. They enjoy hammering together birdhouses, helping build a tree house, cooking, cleaning. If a child-like adult, they likely want to fix things around the house be it a leaky faucet or creaky floorboards. They are into home repair and/or handmade gifts. They are also industrious when it comes chores, taking on extra in order to earn extra money. They'll water lawns, walk pets. They're very frugal with that money, keeping it in the piggy bank and counting it out often to see how much they've got. Similarly, they're very health conscious, seeing exercise not as a competition (as a Page of Wands might) but as self-improvement. They're more interested in beating their own record rather than someone else's. As a child, they may seem too serious and adult-like. As an adult, they may seem to be stuck doing more "child-like" work, like being a dog-walker, rather than employed in a more adult job. Though they can be generous and good hearted, the querent should be warned that being "immature" this person will rarely do anything for free, not if they can get someone to pay them to do it. Meaning if the querent goes out on a date with this child-like person, they'll be eating somewhere cheap or going Dutch. There is an element of "what's in it for me?" in the Page of Pentacles. Learn the Page of Pentacles tarot card meaning and the rest of the card meanings, symbols and stories in our eBook.